To help control insects and keep them from contaminating valuable warehouse stock, PVCStrip.com offers insect fly traps. When used in conjunction with air curtains, these fly traps can eliminate the majority of uninvited flying pests that may enter the workplace. Ideal for restaurants and food service industries, the silent fly traps offer an aesthetically pleasing way to control insects. Flying insects are naturally attracted to the UV lights emitted from the traps but, unlike bug zappers, adhesive boards quietly catch the insects without the loud, “zapping” sound. A single wall sconce unit can cover 900 square feet and should be mounted no higher than five feet from the floor. Available wall models come in white or gold metal and blend effortlessly into the food service environment or warehouse environment. Insect fly traps are one of the many items offered by PVCStrip.com that help control insects. Additional items that can be used in conjunction with a fly trap include an air curtain or a PVC strip curtain. Insect fly traps can be mounted in all areas where there is a need for additional levels of insect control. 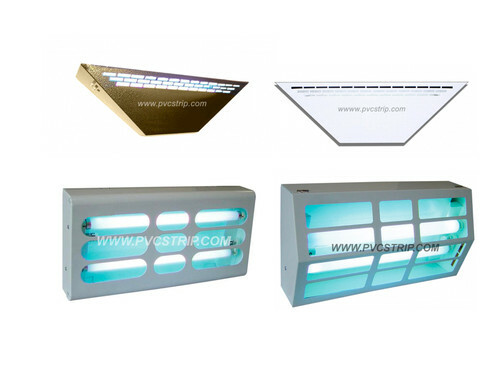 The insect fly traps available through PVCStrip.com utilize 15 watt, high intensity UV light to attract insects and replaceable adhesive pads to catch them. For more information on insect fly traps, please call 888-303-8515. Representatives can also be reached at contact us.